Niue normally has a benign climate. But because it sits on the edge of the south west Pacific’s hurricane belt, it is struck at least once every 7-10 years by a tropical cyclone – the catastrophic weather event known in the northern hemisphere as a hurricane. Twentyone tropical cyclones hit Niue between 1905 and 1990, with at least three times as many coming within 100 km of landfall. The high winds, lashing heavy rain and the high pounding surf can cause massive damage and economic upheaval. 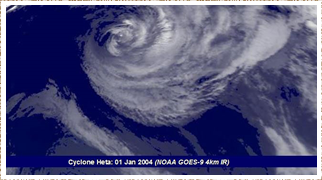 The most recent major cyclones are Cyclone Ofa (February 1990) and Cyclone Heta (January 2004). Cyclone Heta – with winds of 140 knots (260 km/h) and gusts over 300 km/h – is the biggest storm ever recorded in the Pacific. Source: Hurricanes and socio-economic development on Niue Island, by Judith C Barker. Victoria University of Wellington, 2000.